© Provided by Bang 'New Girl' actress Zooey Deschanel is being sued by her former management, Seven Summits Pictures & Management, which represented her from 1996 to 2013. Zooey Deschanel is being sued by her former management. Seven Summits Pictures & Management - which represented Zooey from 1996 to 2013 - wants a share of the profits from the sale of her entertainment website, Hello Giggles, which was reportedly sold for between $20 million and $30 million earlier this year. In a complaint filed on Wednesday (17.12.15) in Los Angeles Superior Court, the company asserts that it is owed the money because it worked with Zooey to get the company up and running. Zooey, 35, had also been paying post-termination commissions for her TV comedy 'New Girl', which she started working on in 2011 but the company claims that she has now stopped paying and accused them of fraud over her contract. 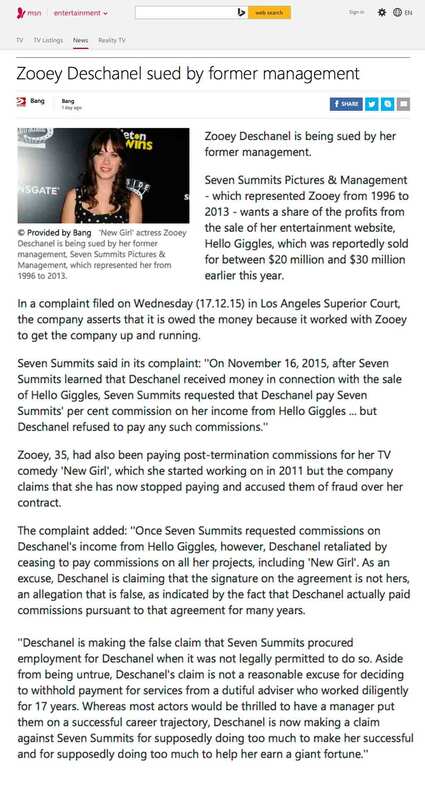 The complaint added: ''Once Seven Summits requested commissions on Deschanel's income from Hello Giggles, however, Deschanel retaliated by ceasing to pay commissions on all her projects, including 'New Girl'. As an excuse, Deschanel is claiming that the signature on the agreement is not hers, an allegation that is false, as indicated by the fact that Deschanel actually paid commissions pursuant to that agreement for many years.